Yesterday I posted a picture of a very red pair of lips and told you it was a worthy Chanel Dragon rival. A handful of you guessed what it was right off the bat, which told me two things: 1) Ellis Faas might not be as obscure a brand I thought it was, and 2) I need to make the guessing game harder. 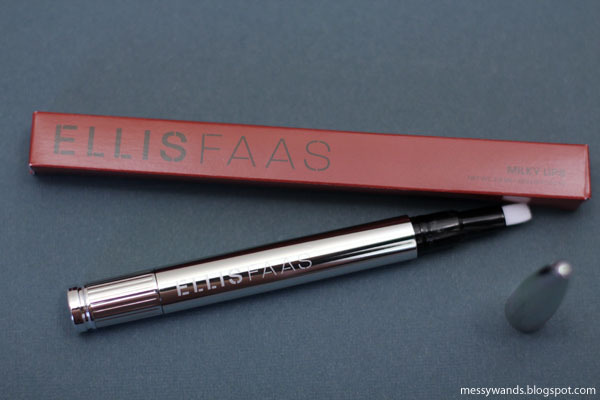 The lipstick in question is indeed Ellis Faas L201, otherwise known as the Ellis Faas signature hue, Ellis Red. A little bit about Ellis Faas for those unfamiliar to the brand. 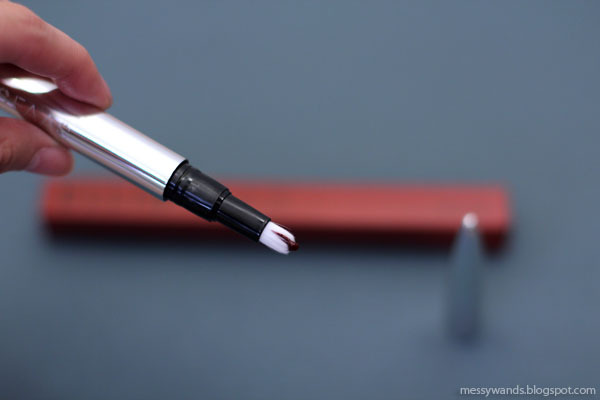 Ellis Faas offers its products for skin, eyes, and lips in the form of silver twist-up pens. Their lip series is divided into three categories: Creamy, Milky, and Glazed. According to their website, Creamy Lips comes with a sponge applicator that provides long-lasting coverage, Milky Lips delivers a wetter, less heavy finish, whereas Glazed Lips proffers the slickest finish of them all. I've only tried the Milky series, which comes with a brush applicator, as seen below. This is how it works: when you twist the bottom of the pen, you'll get a dollop of blood red fluid peeking out from the bristles. Spread the liquid evenly around the lips with the brush, and you're done! Be careful not to get too excited during the twisting or you might get too much product. I have to say it. Ellis Red makes me think of a vampire post-feast. It goes on super wet and stays wet for as long as it remains on my lips, and that is a significant amount of time. I wore this out to dinner once where after sampling a huge portion of seafood pasta, a girl friend turned to me and asked me how I managed to make my lipstick last through the meal. My reply was, "it's still there?!" and I whipped out a mirror to check. I didn't prep, prime, line, or set it, yet my lips were pretty much the same as before. The only part that faded was the inner section of the bottom lip. Astonishment turned to wonder, and that was when I knew I had to feature Ellis Red on Messy Wands. Due to its construction, Ellis Red might be the easiest red ever to apply on your lips. Makeup artists always tout the lip brush as the must-have precision tool when applying deeper hued lipstick. Lo and behold, Ellis Red already comes with its very own brush! I thought I should also address how it compares to Chanel Dragon. They're similar products in that both are very pigmented liquid lipsticks. However, Chanel Dragon looks and feels denser compared to the wet Ellis Red. I am very aware that I'm wearing pigmented lipstick when I have Chanel Dragon on, whereas Ellis Red feels so light that at times I wonder if it's still on my lips (I'll have you know, my periodic mirror checks never disappointed). The only con I can think of is that the formula is as "liquid" as it appears on the lips, so it doesn't "settle" onto the lips like normal lipsticks would. This doesn't mean the color will swim unfettered around your lips after application. I would just be very careful if I were wearing a scarf or light-colored clothing, or if I have my hand anywhere near my mouth. Many a dear item have been relegated to the bin due to unremovable lipstick stains, and Ellis Red would be an easy villain if given a chance. Needless to say, having a mirror handy is almost a prerequisite to wearing Ellis Red. Ellis Red retails for $35 and can be purchased at Space NK, ellisfaas.com, and sephora.com. I'm so happy with this, I think it's high time I try out some of their eyeshadows. Okay. So, I have and love Ellis 201, but it definitely does NOT look this good on me! I'm going to have to pull it out again and give it another go - I haven't worn it in aaages. Either way: love this one on you! @Rae It looks amazing on you. In fact, I got this *because* of you! Love the whole look. Not sure if I can get this in Hong Kong, will have to hunt it out! Another post on the eyes today pretty please? It's beautiful! :) I have this on my to-buy list. Do you find this easy to make a bit sheer, or should it only be applied as an opaque red? Wow, huge statement about being a rival to Chanel Dragon! I must check it out, though I'll probably end up buying it. You're such a bad influence haha. 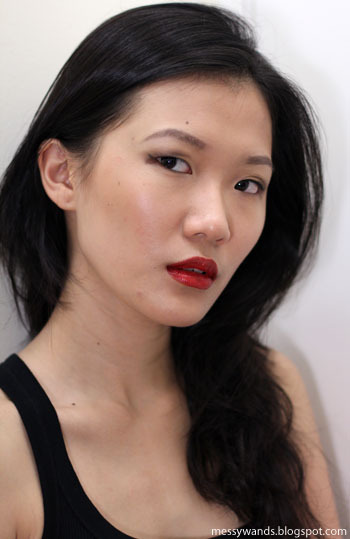 I've always been afraid of red lips, but after seeing this, I may just have to get over it! @PerilouslyPale Ahh I see why it could be confusing. I think all red lipsticks, no matter what texture, transfers IF you touch them. Since Ellis Red is really wet, it would transfer onto more than say, if I used a matte lipstick. I did mention that the inner section of the bottom lip faded :) The rest (bottom lip line, upper lip) remained intact after the meal. I guess I didn't wipe my mouth throughout the meal? (gross I know) but I was surprised that it lasted nonetheless. Impressive. I had imagined Milky Lips as more of a gloss, but this looks like a sophisticated lipstick with a lot of shine. Besides the eyeshadow, are you thinking of trying out the Creamy Lips as well? I'd love a comparison of the two. Thanks for the link; that's exactly the sort of information I need. I think I'll add Milky Lips in this color to my next Sephora order.